I volunteered at Red Hook and was overwhelmed by the kindness and community created post-Sandy by the people in New York. There were donations of food, cleaning supplies, power outlets, and free Internet to connect to loved ones. Volunteers lined up waiting to help people clean, take apart, and re-build homes, art studios, and businesses. I helped rip out drywall, hammer down marble kitchen counters, break apart cabinets, throw out decades worth of artwork damaged by water, and remove valuables onto the side of the road to be thrown away. Even in these moments, many of the artists and residents affected by Sandy remained positive making light of the heavy situation. Ray Smith, “Pollo Pecking,” 2013. Wood and steel, 63 x 61 x 18. Courtesy of the artist. Ray Smith, a painter and sculptor who came into prominence in the ’80s with his magic realism, blending surrealism and high modernism using anthropomorphic animals and illusory juxtapositions, was terribly afflicted by Hurricane Sandy. His studio, located in the Gowanus neighborhood, was flooded several feet deep. Nearly 30 years of his work were submerged in the water, which he and his assistants tried to save. It is difficult not to imagine the works in the exhibition made in 2012 illustrate the story and emotions of when Sandy hit. The wooden sculpture, Keegan (2012), with a maniacal humanlike face standing on two legs, impersonates the anxiety produced by the menacing storm as it approached. La Infermera (1987) has a wooden oar vertically in the air with a small red cross implying a request for aid. 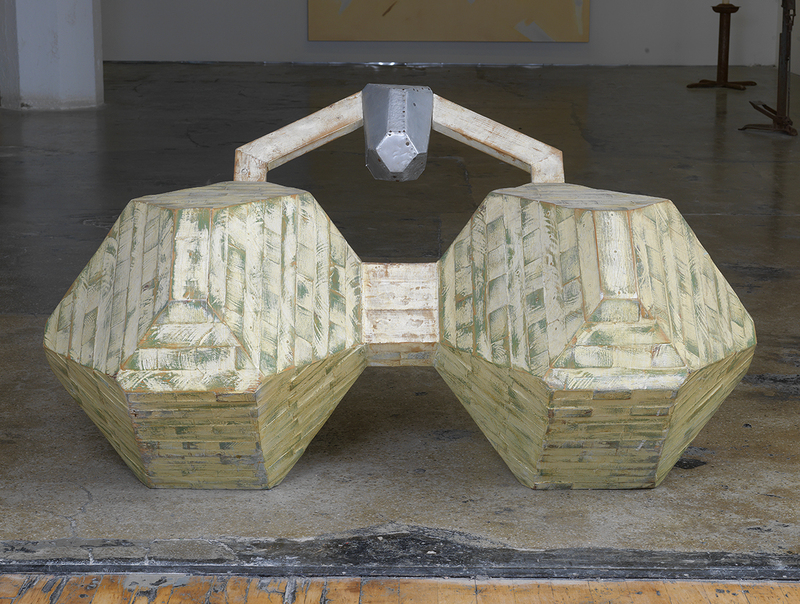 Smith’s other work, Chico Huevon (1987), with two wooden truncated polyhedrons, has a wooden band joined by tin connecting the polyhedrons together. This piece characterizes the unlikely juxtapositions hurricanes make as the wind breaks things apart and then throws them together without reason. But it is the piece, Pollo Peking (2013), that tells the story of “surviving” Sandy best. 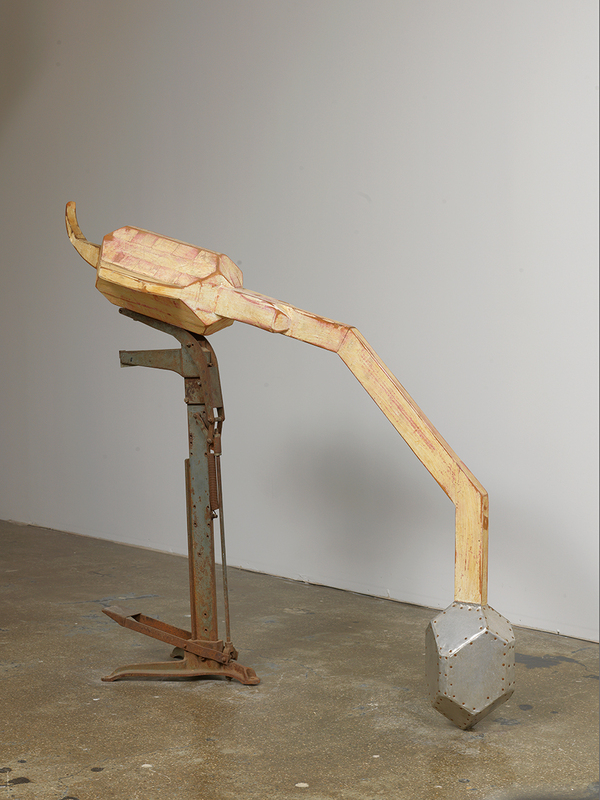 A wooden chicken with a tin mouth and legs made out of steel leans over as if it is picking up something from the ground. I like to imagine this figure as an allegory of the community post-Sandy. It implies the resilience of those affected as they pick up and start over—exactly what Smith did. Ray Smith, “Chico Huevon,” 1987. Wood, tin, dimensions variable. Courtesy of the artist. Photo by Brian Buckley.